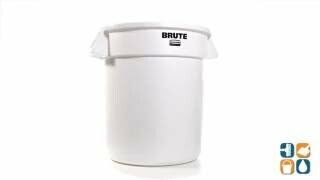 Built to last and perfect for commercial, industrial and residential environments, these quality Brute trash cans are durable both indoors and out. Rubbermaid Brute trash cans are a seamless design and are made of polyethylene construction that won’t dent, rust or leak. A reinforced rim and base set the standard for Rubbermaid quality. 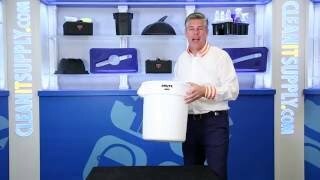 For convenient waste collection from one location to the next, the heavy-duty, Rubbermaid 10 Gallon Brute Trash Can is the complete garbage receptacle. White color is NSF/USDA. Approved for food contact and NSF tested/certified. Rubbermaid 2609 Brute 10 gallon trash can lid is sold separately, RCP 2609. Dimensions: 15-5/8" Diameter x 17-1/8"H, 10 gallon capacity.